Get the whole family involved. Pressions for Families! 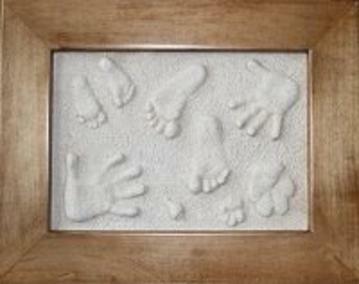 Make a beautiful keepsake of Mom, Dad and the Kids - you can even include the family pet! This exra large kit for great fun! Now the whole family can get involved! Outside measuremnets are 16 3/8" x 20 7/8", inside measurement 10 1/2" x 16 3/8". The prints are made in sand allowing you multiple opportunities to get the perfect print! Try it, if you are not satisfied, rearrange the sand and retry. Reposition the hands and feet, have a look, if you like it great if not try again. The finished work of art will be raised prints of everyone with a lovely sand finish, you will be so pleased!